Say more than just “thank you” for a job well done, be sure to show it with a card as well. Cut a 2” x 17” strip of paper. Score the strip at 1” and fold in half (creating a 1”x17” strip). Adhere the folded strip as a binding to the edge of (2) 11” x 17” papers, thus creating a card. *Note: be sure to line up the edge of each 11”x17” sheet with the fold so that the card opens as desired. Cut half-heart shapes from a sheet of paper. Fold cut section up. Adhere the cut paper to the front of the card with dimensional foam squares. Print or write a sentiment onto a strip of paper. Cut the strip into a banner shape using the corresponding card banner template piece. Score and fold the banner using the dotted lines on the template as a guide. Adhere the banner to the front of the card. Not quite comfortable with cutting half heart shapes? 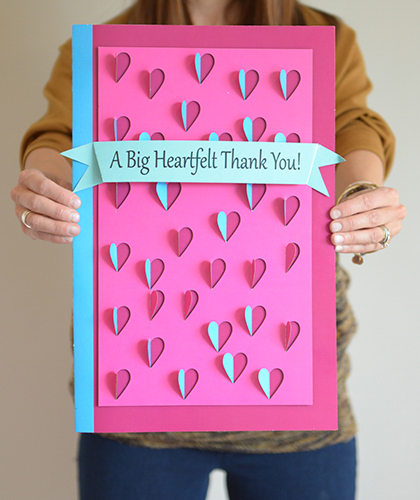 Try cutting out several complete hearts from a coordinating piece of cardstock and adhering them to the front of the card using adhesive foam squares. Add in a print or different solids to create a customized card. Use the same design on different sizes of paper—this will create an easy variety of theme and purpose for each card.